Proverbs 10:20-21 "The tongue of the righteous is as choice silver, the heart of the wicked is worth little. The lips of the righteous feed many, but fools die for lack of understanding." ...is to make an encouragement card with a touch of silver. After stamping and heat embossing my image I used a bleach technique to remove all the color from inside the image. I stamped the image on Sahara Sand cardstock and when bleached it leaves a pale yellow shade. I decided to leave the pale yellow for the centers of my flowers but to replace the rest of the color in the petals and leaves with my Copics. I noticed that in some areas where the bleach had gone outside the lines it gave the image a 'highlight or halo' effect which I liked. So after coloring my image in with Copics I went back around the edges of the image with bleach using an aqua painter to get the 'halo effect' around my entire image. Over at Craft Us Crazy, there challenge was to use something new and/or your favorite embellishment. Something new would be my Elements of Style stamp set and Because I Care stamp set. I really love all my embellishments but, my all-time favorite which I have a ton of is brads! 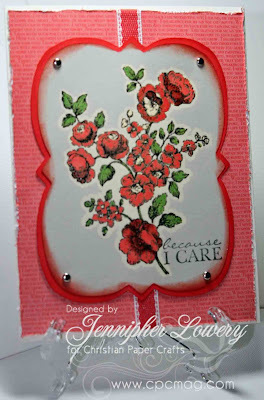 Stamps: Elements of Style & Because I Care - Stampin' Up! Oh Jennipher this is absolutely stunning! The image is colored beautifully! The bleaching technique really added a lot! Thanks for joining us at Stampin Sisters in Christ! This is striking, love the bleaching and the colors. Just gorgeous. So very beautiful, Jennipher! What a wonderful technique. A beautiful card Jennipher and so pretty. The bleaching technique really made these flowers pop! I love how you colored the flowers and the shape of your focal image looks amazing! This is stunning! I love how you framed this beautiful image and the distressed edges. Hi Jennipher, your card is stunning! I love the colors and inking around the edges puts a beautiful frame around the flowers. Such a pretty card tfs!!! This is such a beautiful card Jennipher! I love the colors you used & the layout is FAB...awesome work Hun & TFS!!! the whole look of your card is so noble and classy! a beautiful card Jennipher, just took a look through your work and it's all so very gorgeous, you are a very talented stamper. Thx for the sisterly congrats on the Shining Light award and I feel the same, good to "meet" you here. I'm so glad some people can use bleach to a lovely effect such as in this card. :0) I have asthma and cannot use bleach.